Here's a nice article that appeared recently in The Villages Daily Sun Newspaper. The VillagBob Westfall will never forget the comrade who saved his life in Vietnam. That’s one reason he attended the Memorial Day Ceremony Monday at Veterans’ Memorial Park of The Villages, where he was among hundreds of Villagers and area residents who gathered to celebrate the observance. Richard Simpson, president and commander of Veterans’ Memorial Park, opened the ceremony with a welcome. 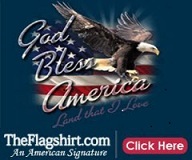 He recounted the history of the observance, known as Decoration Day until 1971, when Congress declared it a national holiday known as Memorial Day. The sounds of the bagpipes hung in the air; then silence as the crowd of red, white and blue stood at attention for the presentation of the flags. Flags representing the U.S. Army, Marine Corps, Navy, Air Force and Coast Guard were presented with assistance from the Veterans’ Memorial Park Honor and Color Guards. Representatives from the Jewish War Veterans Post 352, American Legion Post 347, the Vietnam Veterans of America Chapter No. 1036, the Puc Puggy Chapter of the Daughters of the American Revolution and more were present. “I’m glad to see so many veterans and loved ones of veterans come out today,” Westfall said. A member of the Army, he served in Vietnam for two years. Her husband, Gale, served in Korea in the Army. 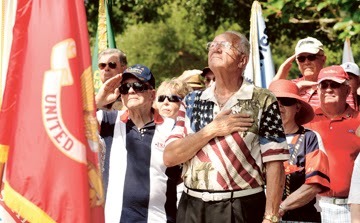 It was their first time attending the ceremony at Veterans’ Memorial Park in The Villages.